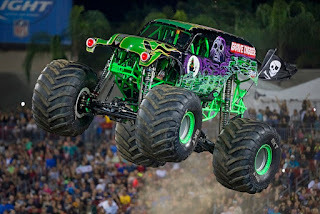 Monster Jam will be at Raymond James Stadium for two big shows in Tampa: January 14 and February 4 at 7 p.m. For tickets and complete details, visit monsterjam.com and follow #monsterjam online. Dennis Anderson will be driving Grave Digger (Jan. 14 show only), and his son Ryan Anderson driving Son-uva Digger in our show. Two generations of Monster Jam drivers competing to be the Tampa champion. Monster Jam competitors are trained at Monster Jam University to master the skills of driving Monster Jam trucks. Only those Monster Jam athletes highly proficient in scaling their extraordinary driving skills will push the limits and optimize all types of racing and obstacle courses here in 2017 in Tampa. Approximately 12 feet tall and 12 feet wide, Monster Jam trucks are custom-designed machines that sit atop 66-inch-tall tires and weigh a minimum of 10,000 pounds. They are built for short, high-powered bursts of speed. 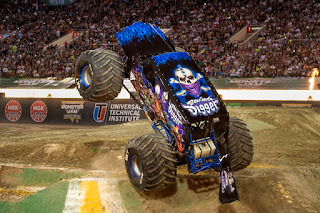 Monster Jam trucks generate 1,500 to 2,000 horsepower and are capable of speeds of up to 100 miles per hour. 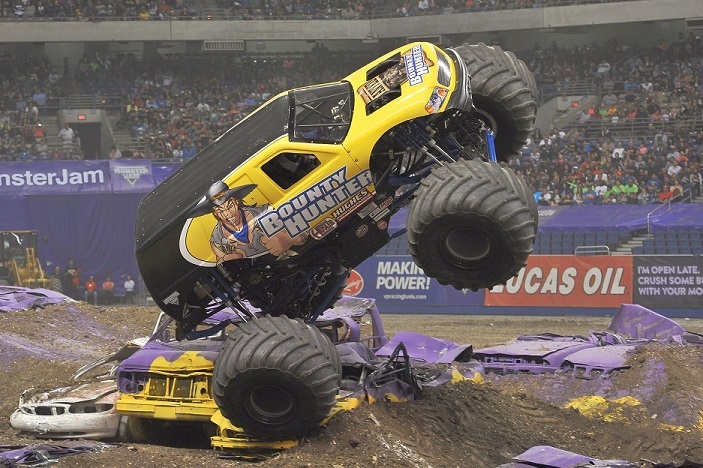 Monster Jam trucks can fly up to 130 feet (a distance greater than 14 cars side by side) and up to 35 feet in the air. The Party in the Pits on is 2:30 to 5:30 p.m., and it’s where fans can get up close and personal to the Monster Jam trucks and drivers. Tickets are $10 in addition to show tickets. They’re on sale now, and will be free at participating Southern Ford Dealers’ locations. Who is excited? I know I am! Look at these trucks! I will be writing about my experience, so make sure you keep an eye out for it. Have you been to Monster Jam? Who is your favorite truck? I need to know who to cheer for! I have three tickets to giveaway to one lucky reader! These tickets are for the Saturday, January 14th, 2017 Tampa show. Make sure you can attend if you enter. You must be 18 years old and have a valid ID to pick up tickets. To enter, leave a comment below telling me your real name, email and if you have ever been to Monster Jam before. For a bonus entry, share this post and leave a second comment with the url to your share. This giveaway will only be open a short time! It will close January 5th at 1am. Good Luck and I will see you all there! I've been to Monster Jam, but Avery never has and he is obsessed with anything to do with vehicles of all kinds. He'd probably lose his mind if he got to see them in action! My 9 year old, Bobby, has been but it was a handful of years ago. It's been even longer than that for Christoph & me. Thank you for having this contest! Yes!! We go every year!! I've never been to Monster Jam. I have always wanted to go, and my hubby has always wanted to check it out. It looks like it would be a super thrill! I've never been to Monster Jam but I have tailgated with some buddies for it. Always wanted to check it out.